Once a Month Cooking, Freezer Cooking, Batch Cooking, Bulk Cooking…the internet (and library bookshelves) are awash in different methods of cooking meals ahead. There’s a reason for it, I believe; busy moms (and busy humans) are looking for ways to make their lives easier. I have been doing one form or another of batch cooking (as I like to call it) for over ten years. 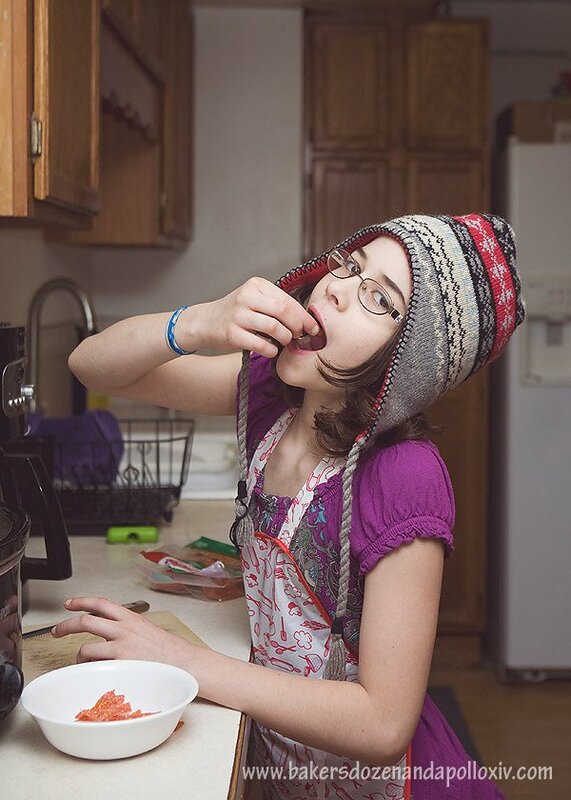 My methods have changed depending on my circumstances and I’ve had long periods where I have done no cooking ahead. 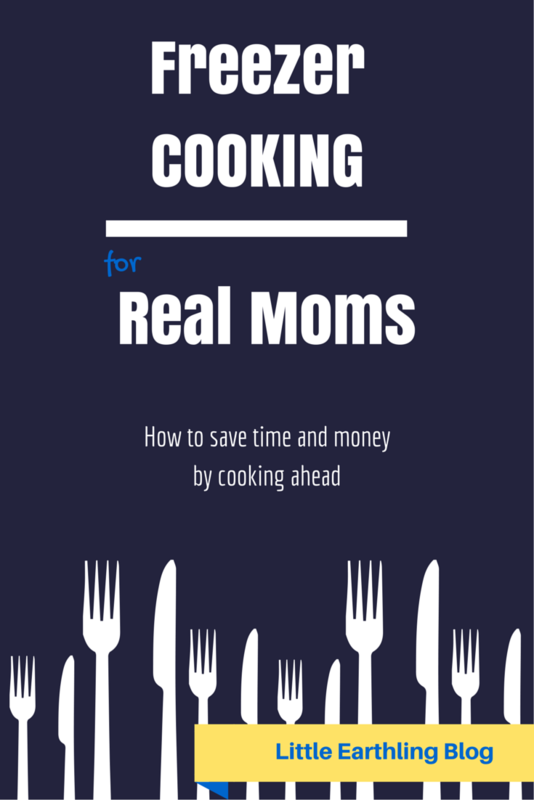 Today I want to share with you Freezer Cooking for Real Moms. I am a real mom. I am a busy mom. In fact, I am so real and so busy that I haven’t put a meal away in my freezer for months. We have been short on both finances and time this past year and freezer cooking takes a bit of both. Last night I soaked four cups of beans in the crockpot for White Chicken Chili. This morning, I drained the water and added chicken stock (made from a chicken we ate this weekend). When the beans are done cooking, I will add the other ingredients and this will be tonight’s dinner. Next up was lasagna. 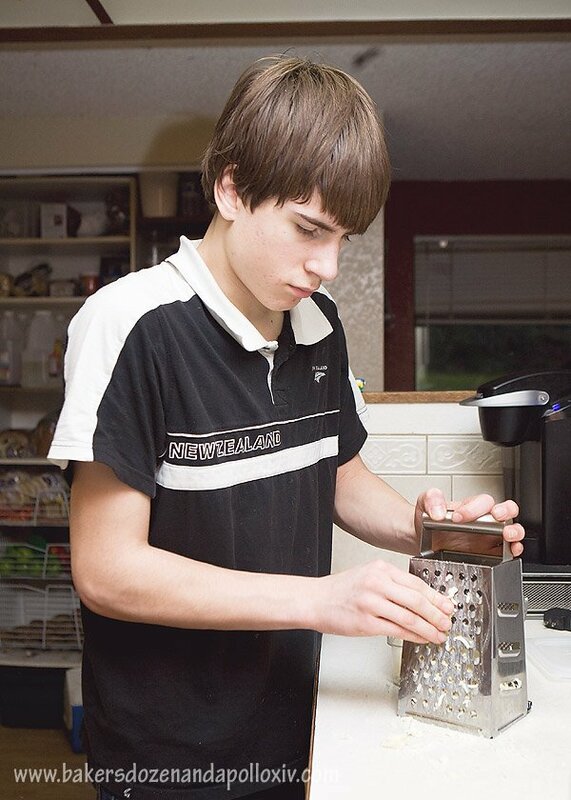 Enoch (13) grated the mozzarella and Tucker (8) mixed the cheeses, spices and eggs. Both boys worked together to assemble the lasagna. I used to make my spaghetti sauce, but have found it more economical to just buy the big #10 cans. This time, however, I bought Prego spaghetti sauce because that what the store I was shopping at happened to have. We already had lasagna noodles (we buy a ten pound box at a time) and some cooked ground beef in the freezer. 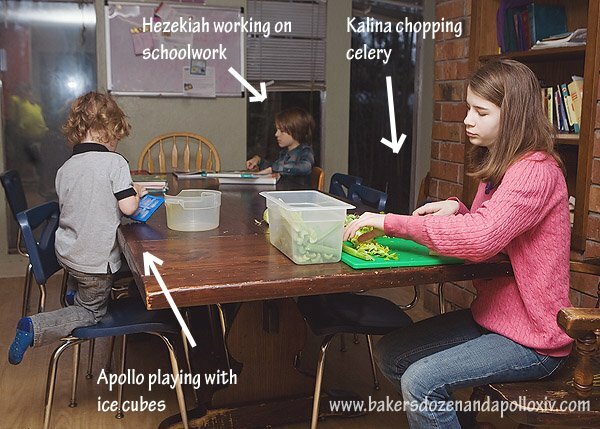 While we were working on that, Hezekiah had started his schoolwork (there wasn’t room for him in the kitchen) and Kalina washed and chopped celery and carrots for use in lunches and the beef stew we’ll be having later in the week. Tucker was so proud of his lasagna! This meal will be eaten tomorrow, so into the fridge it goes. We put a bag of olives and shredded mozzarella on top. 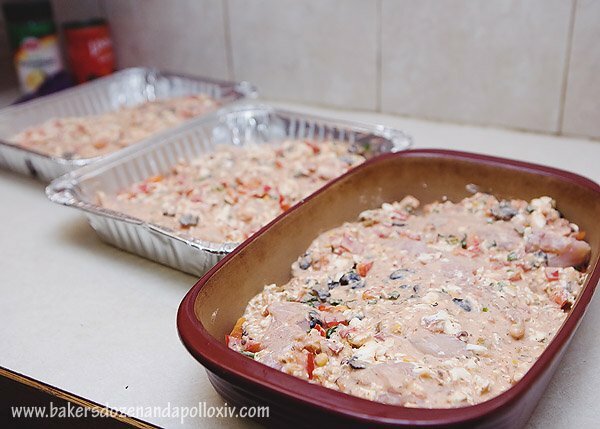 We will add those when it is almost done baking. 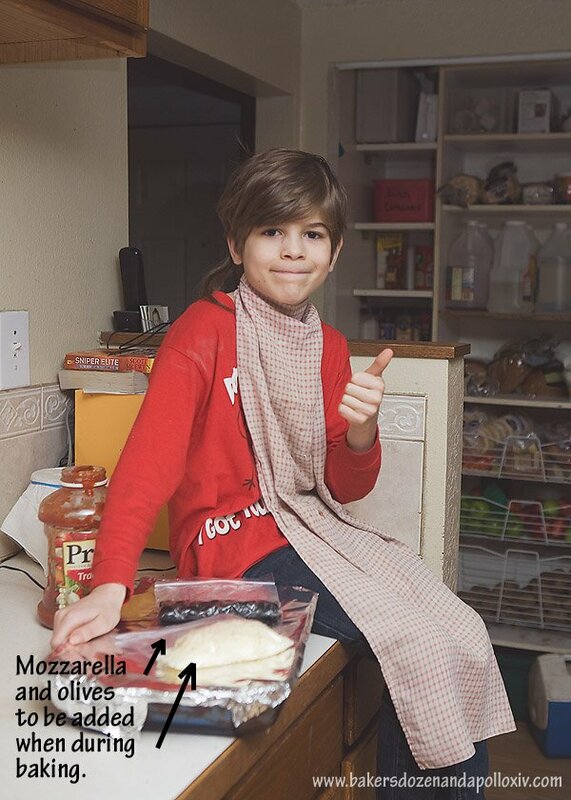 Once the lasagna was done, Tucker mixed the cheeses and Jubilee sliced pepperoni for the calzone we’ll have for dinner on Wednesday. These are stashed in our fridge, ready for assembly. I will use the rest of the Prego spaghetti sauce and we will make the dough from scratch. 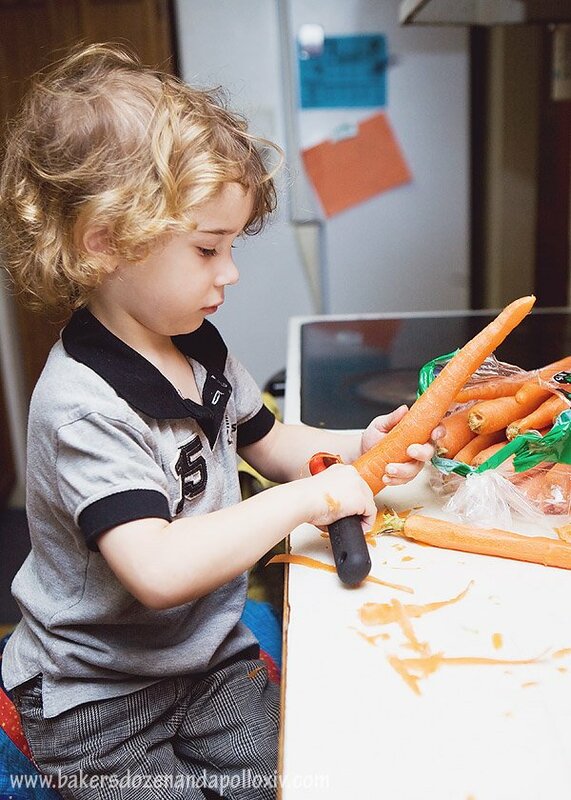 Apollo peeled three carrots before he lost interest! Once those were done, Enoch and I mixed up Lemon Chicken and Mariachi Chicken Rolls. 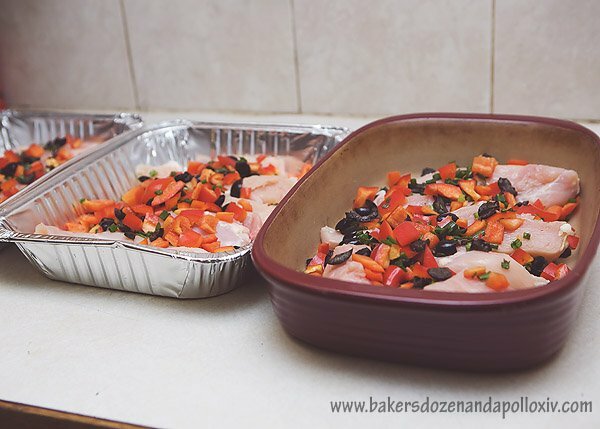 Only, when we got to the “roll” part, I realized the chicken breasts I purchased were too thick…so I simply layered the ingredients in the pans. And, I only had two freezer pans, so one of these will be eaten this week. 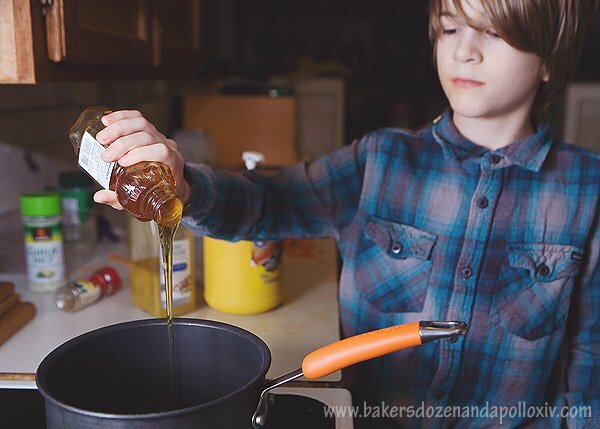 Once we were done with that, we put Hezekiah to work cooking the sauce for Honey Glazed Chicken Thighs. We also cooked a pound of bacon “ends and pieces” in the oven. These are put in the freezer and added to things like scrambled eggs and mac and cheese. So here are the REAL numbers. We began cooking at 9:30 and ended at 11:00. We washed the dishes as we went along, so when we finished up it was perfectly clean and lunch was ready! I call this Freezer Cooking for Real Moms, because of course I didn’t purchase every ingredient for every meal! I used what was in my pantry already and used the meat that I purchased on sale. Lasagna and Calzone: the ingredients I purchased cost a total of $30.21. I have spaghetti sauce, cottage cheese, parmesan cheese and ricotta cheese left over (these will go in other meals including our English muffin pizzas for lunch). $30.21 means $15.10 per meal or $1.25 per serving. This is more than I usually spend, but watch how the meals average out in the end! Honey Glazed Chicken Thighs (from Fix Freeze Feast): six pounds of thighs $6.50, honey $2.67 for a total of $9.17 or $0.76 per serving. Lemon Chicken (from Love in the Kitchen): six pounds of chicken thighs $6.46, lemon juice $1.78 for a total of $8.24 or $0.69 per serving. Mariachi Chicken Rolls (from Fix Feast Freeze): boneless skinless chicken breast $11.92, one can of olives $0.98, salsa $4.40 (we only used 1/4 of the bottle). We used red peppers and cream cheese that were already in our refrigerator. For a total of $17.30 for three meals. $5.77 per meal or $.048 per serving. To crunch the numbers even more, I spent $64.92 on the ingredients for the main dish for seven meals. This comes to a total of $9.27 per meal or $0.77 per serving. Now, obviously these are main dishes, not complete meals. These will all be supplemented with: rice, potatoes, salad, bread, etc. 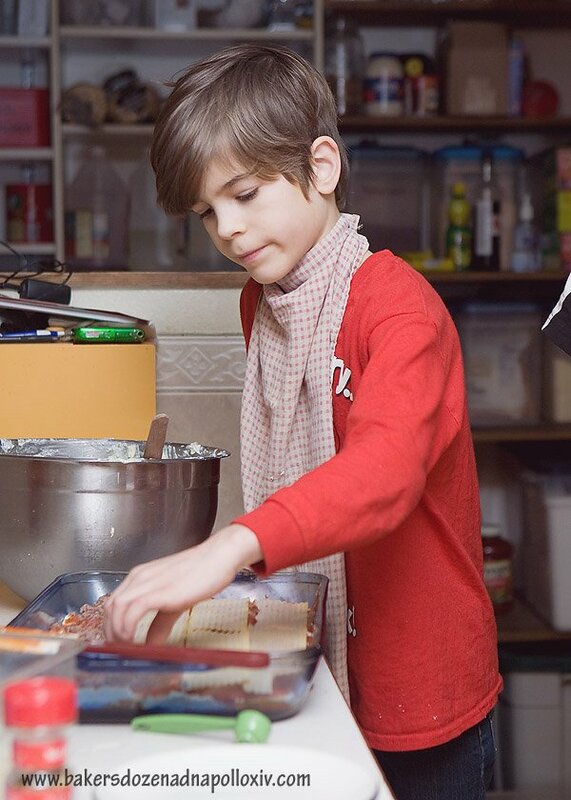 But that is real cooking, by a real family. 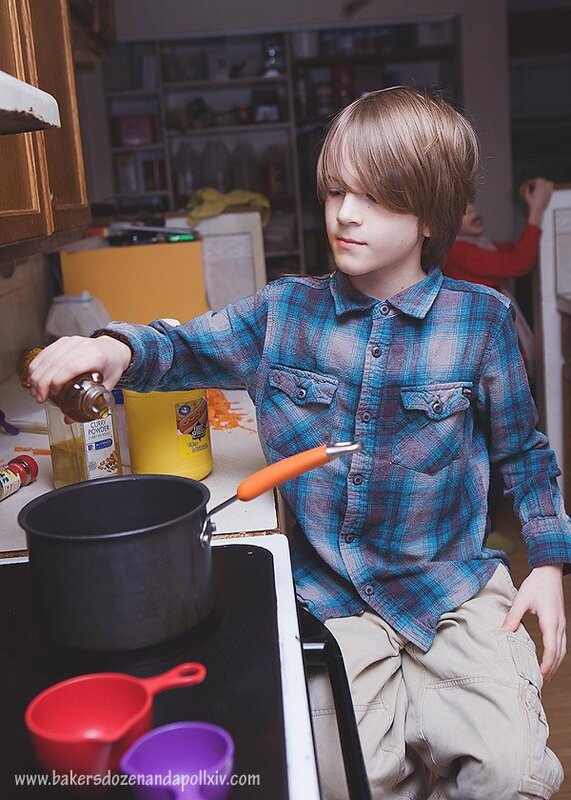 We spend 90 minutes prepping meals and cleaning up…which averages to 13 minutes per main dish! While I love freezer cooking, I find I don’t have hours to dedicate to cooking multiple meals at one time. My solution has been to take one meal and quadruple the recipe. We eat one that day, the rest go into the freezer. If I do this a few times a week, we end up with the freezer stocked and it didn’t take me all day/weekend to do it! This method works better for me as well. I loved this post. I don’t have as many kitchen helpers who are actually helpful as y do, so I was amazed at what you accomplished in 90 minutes. I still have 5 in the “letting me help now will pay off eventually” phase. When is eventually?! YOU. ARE. AMAZING! I have a hard enough time feeding my family and it’s less than half the size of yours (we have 6 people to feed with our exchange student.) That plaid shirt on Hezzi? It was Cyrus favorite – I had to sneak it out of the house and after if was gone I told him – it was ridiculously small on him but he still wore it whenever he could! This is delightful! I keep on telling myself that I need to do more freezer cooking. This definitely inspires me to do so! Thanks so much for sharing (and for linking up to the SHINE Blog Hop). Thank you Jennifer. It’s been fun and I love exploring all of the new blogs!